But the amazing thing about going green is that the opportunities are endless. Whether it’s using natural air fresheners, homemade soaps and detergents, conserving water, recycling paper and plastic or installing low-flow shower-heads, every little bit makes a difference and you can start right now. Even though it might not seem like you play a significant part in the green movement, you do and your influence does as well. Let’s tackle the first question, “Where do I even start?” If you feel overwhelmed, start out small. As they say, “Rome wasn’t built in a day,” so don’t stress out. Begin by adjusting your routines. For starters, unless you’re washing towels or items that need are in need of serious disinfection, switch the washer knob to “cold.” See, this isn’t so bad! We’re just going to continue easing you into this. What else can you do in your laundry room to save money and conserve water, you ask? Wait until your hamper is completely full to wash a load. Just because your washing machine has “small” as a load option doesn’t mean you should use it. Jeans that have been worn a couple of times or a shirt that is worn once don’t need to be thrown in the hamper just yet. Inspect the water fixtures connected to your washing machine for leaks. If there’s moisture, you more than likely have a leak. When replacing your washing machine, look at Energy Star and other high-efficiency models. Depending on the model you have, you could save up to 20 gallons of water per load! Let’s shift our attention to the bathroom. Are you guilty of running the sink while brushing your teeth? We aren’t judging, but if you do turn the water off, you’ll save 4.5 gallons each time! Think about it. If you brush your teeth twice a day, that’s nine gallons a day. Now, who else in your family does the same thing? Make it a goal for everyone in your household to turn the sink off. Test your toilet for leaks by adding a couple drops of food coloring into the tank. Once you place the drops in the tank, don’t flush. If the dye appears in the bowl, you have a leak. If you don’t know the first thing about fixing a leak, read our blog for How to Fix a Toilet Leak. If you are still having difficulties, give Larry & Sons a call – (301)733-5428. We’ll be more than happy to address the issue! If you shorten your shower by even just a couple minutes, you’ll conserve up to 150 gallons per month! Now add that to each family member. Keep a bucket under the faucet and use it to water your plants. Choose low-flow shower-heads. In just a few short years, the gallons per minute (GPM) standards have changed. A standard shower-head from two years ago would have had a 5-8 GMP while today’s have a 1.5 or below rating. For ways to make your kitchen Green and energy-efficient, see our blog, Energy-Efficient Kitchen Tips. See, a majority of the things listed above require simply altering your daily routines. For beginners, we believe this is a good place to start. Water is such a critical component of our society and is necessary for sustainment. Let’s conserve and be smart wherever we can. For a comprehensive list of things you can do inside and outside your home to save water, money, and the environment, see this list of 100 Ways to Conserve Water. One of the biggest sources of home water waste is water leaks in and around your home. 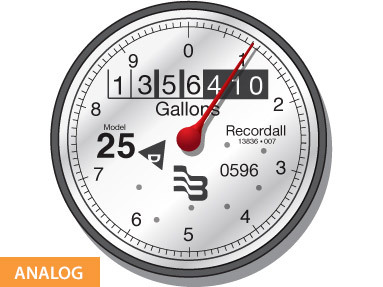 You can find out how to read your water meter to determine if you have a leak from smarthomewaterguide.org. 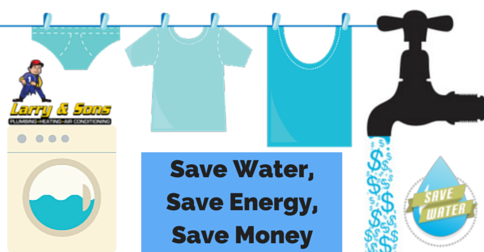 For more ways to save water, give Larry & Sons a call at 301-733-5428. If you are still having trouble finding or repairing your water leaks, or need help finding/reading your water mete, give Larry & Sons a call at 301-733-5428. We’d be more than happy to help! Check out our maintenance plan; we provide annual HVAC tune-ups, 15 % off all repairs, and much more!